A key part of successfully growing cannabis with LED grow lights and maximizing your yields is getting your light schedules or light recipes just right. For beginners especially this is a big question. What spectrum should I be using, when, and for how long? How does this affect the plants? Where do I start? If you’ve got any questions like that, don’t worry. 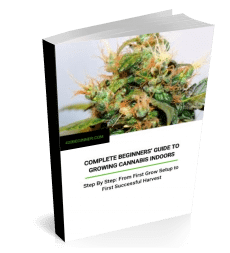 We’ll help you get started with your new LED grow lights and show you exactly what you need to do and when at every stage of the grow. Then, once you’ve mastered the basic recipes, it’s just a matter of fine tuning them to the strains you like to grow. With good LED grow lights and just the right light recipes you can increase yield, increase potency and shave days or even weeks off your grow times! 1 What’s In A Light Recipe? 6 How Long Before You Can Harvest? What’s In A Light Recipe? With growing cannabis it’s all about the light. Cannabis plants love light. And if you’re growing indoors, it’s all about reproducing the growth signals and nutrition your plants would get from natural sunlight. Good LED grow lights are about as close to replacing the sun as it’s possible to get. When you know how to use them. And that’s where light recipes come in. A light recipe is simply a schedule of what spectrum of light you give your plants, how much of it, when and for how long. It’s a way of mimicking and manipulating the plant’s natural growth cycle. As well as the different light quality and night/day lengths the plant would respond to in the wild, from season to season and as the sun moves across the sky during the day. And when growing weed indoors you can even improve on the sun. Because with LED grow lights you’ll never have cloudy days and you can start the seasons whenever you like. You’ll likely be aware that different LED grow lights deliver different spectrums of light. Some have a fixed spectrum designed to be used for the whole grow cycle. However, these don’t allow for much fine tuning. But many have more than one setting. They can deliver a veg or grow spectrum and a flower or bloom spectrum. Some can also be dimmed, which is an alternative to lowering and raising the light. And right at the top end, you’ve got highly programmable lights that let you fine tune not only the spectrum but also the timings to even better simulate the sun. You can pretty much automate the whole grow cycle. There are even LED grow lights for which you can download elaborate, highly detailed light recipes and set them up with just a few mouse clicks, or set them up via smart phone. But for this article we’re going to assume you’ve got something less finely-adjustable that needs a little more hands on attention. Fairly basic LED grow lights where you need to carry out the light recipe yourself. 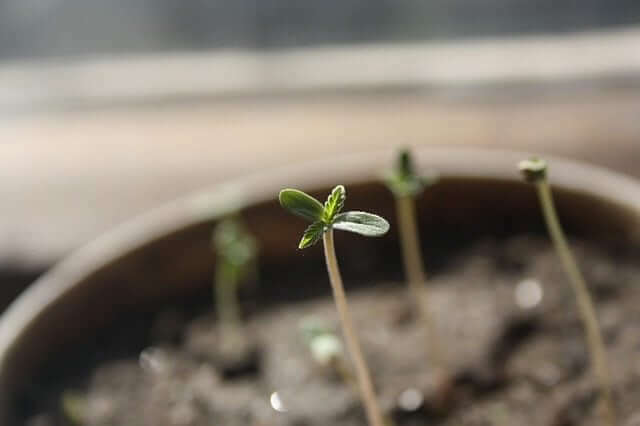 If you want to know how to germinate cannabis seeds, we’ve covered it here. Now, once your seed has sprouted, the heat and light from LED grow lights can help your seedling grow strong and healthy in record time. Set your timer to keep the lights on for 18 hours a day. The plant will think it’s spring and put most of its energy into growing leaves and stems. The other 6 hours should be total darkness. Use the veg or grow setting on your light, or use a full spectrum light, to ensure that the seedlings are getting all the wavelengths they need. Plenty of blue light ensures the seedlings don’t try to grow too tall before they’re strong enough. While the red light encourages root growth. In general, start with your lights a few feet above the plants—seedlings can’t yet stand full strength LEDs. 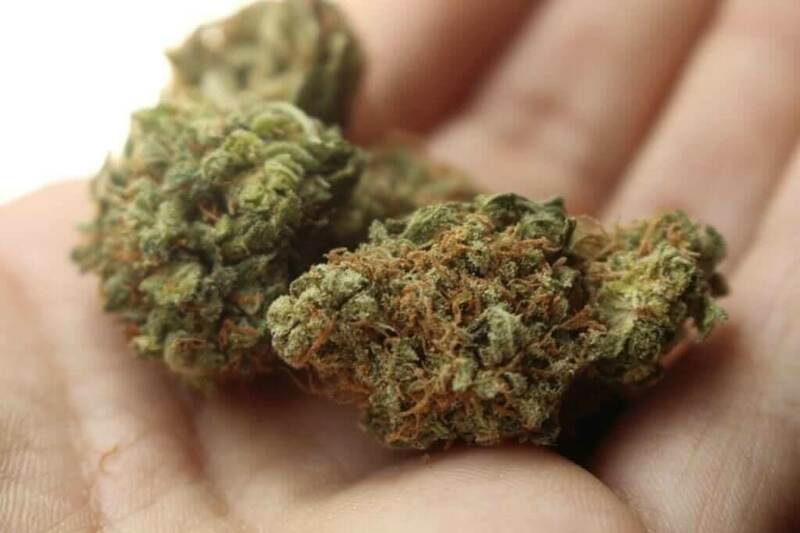 However, the best distance all depends on the specific light, so follow the manufacturer’s recommendations and any instructions that come with the seeds. Remember seedlings can grow quickly. So if you see the leaves starting to bleach, you may need to raise the light a bit. After about 14 days, when they’re growing taller and growing new leaves, the seedlings have reached the vegetative stage. At this stage cannabis plants are mainly growing stems and leaves (no flowers), to store up as much energy as possible before they flower. Switch your light to its veg or grow setting and continue giving it 18 hours a day. Some will switch to 20 or even 24 hours of light per day at this stage to maximize growth. But if you do this, make the change slowly so as not to stress your plants. The veg setting should add extra blues to the spectrum, like you’d get on long clear summer days. With the added blue wavelengths, the plants should grow strong and bushy, rather than stretching up for more light. If you’re growing an autoflowering strain, just stick to 18 hours. Giving it extra hours of light won’t speed up the veg process. If plants are stretching (growing with lots of space between nodes or leaves), just lower the light a bit. You want your mature plants to be strong and healthy enough to bear the weight of the dense flowers they’re about to grow. You can keep your plant at the vegetative stage pretty much indefinitely. So it’s up to you when you initiate flowering. But for most growers that will be when the plant is around half the height it will reach at the end of flowering. Flip the switch to flower or bloom and change your light schedule to 12 hours on and 12 hours off and soon after your plant will start flowering. Or if you want to be on the safe side, you can avoid stressing your plants by switching to a 12 hour cycle over the course of 2 or 3 days. For example, going from 18/6 to 16/8 to 14/10, then 12/12. Once your plants are flowering, make sure the 12 hours of darkness are always completely uninterrupted. Any light leaks during this time can send your plants back to the veg stage, or create hermaphrodite plants that could pollinate your flowers and ruin the harvest. This schedule mimics the shorter days of late summer and early fall when wild cannabis plants would naturally flower. The higher concentration of reds in the spectrum also mimics the sun hanging lower in the sky. And having far-reds within the spectrum has been found to shorten the time to harvest, in certain circumstances. Growth spurts during flowering are common, so keep an eye on the distance between the buds and your lights. If you see bleaching, raise your lights. That said, when flowering you need to maximize the amount of light your plants are getting to maximize your yield. So the closer you can get your LED grow lights to your plants the better, up to a point. Lower them an inch a day and keep an eye out for any signs of damage. 12” to 18” from the plants is usually safe. But as ever, check the manufacturer’s recommendations. LED grow lights with ultraviolet in the spectrum will also stimulate resin production, giving your bud higher levels of THC and other cannabinoids. Autoflowering strains will flower when they’re ready, regardless of light conditions. Usually after three or four weeks. Nonetheless, the bloom spectrum of most LED grow lights will help increase the yield. Also, autoflowering plants don’t need the darkness, so 18-24 hours of light a day will further fatten the buds. How Long Before You Can Harvest? Well, it all depends on the strain you’re growing and the kind of effect you’re looking for when you consume the bud. We’ve covered the subject in a little more detail here. But usually 2 months of flowering is the minimum. The basic light recipes above should be customizable to your chosen LED grow lights and cannabis strain. Some will argue that a full spectrum light can be used at every stage. All you need to change is the timings and height you hang it at. While others will prefer to adjust everything as finely and minutely as possible. To better imitate the sun and save energy by only providing the exact spectrum of light needed at each grow stage or even hour of the day. However, most LED grow lights fall somewhere between the two extremes, offering veg and bloom modes, and sometimes dimmers or seedling modes. And for most of us those more limited options will still offer us more than enough flexibility to discover a custom light recipe that gives great results time after time. At the 2018 LightFair International in Chicago, the horticultural classes focused muchly on cannabis. It was interesting to learn how light affects plant morphology, especially how far red (734nm) promotes early rapid growth. Also, how tuning can affect flavor, color, leaf size and more. As an example, red leaf lettuce is only red because they tune the lights to make the leaves that color. Both sets of slides were really interesting reading. Like you said, it’s fascinating how quantity, spectrum and photoperiod of light can be manipulated and combined to dramatically alter not just how much a plant grows but how it grows — shape, color, appearance, etc. Really highlights the importance of knowing exactly what you want from your end product — are you going to optimize for flavor, aesthetics, THC/CBD quantity, flower size/weight, overall yield, and so on? As one of the slides put it, “Optimal light recipes for specific crops and varietals [are] still largely unproven”, so there’s always going to be some experimentation in getting exactly what you want out of a particular strain and developing just the right light recipe to get it (never mind all the other environmental factors!). Especially with a crop like cannabis that’s been largely illegal for so long and a technology that’s relatively new like LED, since for both reasons reliable, well-tested growing info still can be pretty hard to come by. Always interested to see some good quality info on the subject of LED vs. more traditional lighting too.